Pixar/Disney make beautiful, impactful, emotional movies that explore the nature of feelings and humanity. With Inside Out they take this edict to a new new level by literally exploring the nature of feelings. awed perspective of an 11 year old girl or the fact that the main character is literally Joy (Amy Poehler). Whatever it is, this film manages to capture childlike wonder and perspective better than any movie I have ever seen. It almost feels like a child wrote it (which, with Pixar, I wouldn’t put it past them). There is no cynicism, no disaffection, and no sense of irony to any part of the story. For lack of a better term, every emotion is fully felt and realized in its purest form. Ultimately this is a film about growing up, which is the most melancholy aspect of the film. Our focal character Riley (Kaitlyn Dias) is at the age when childlike wonder turns to…realism. 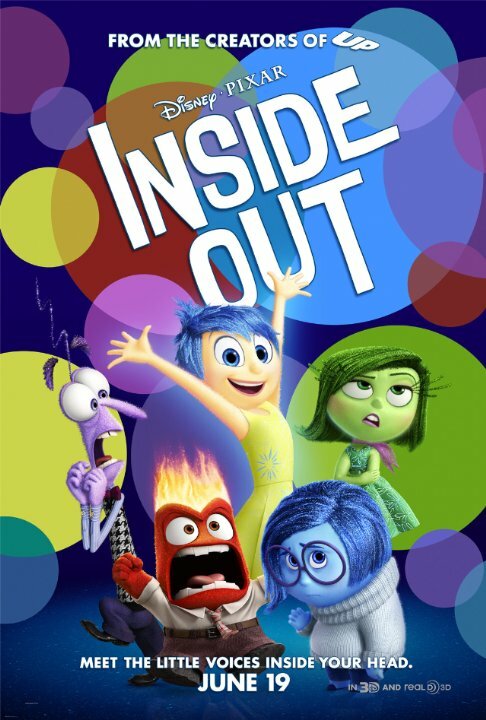 Through the story of her inner emotions, we see how Joy, Sadness (Phyllis Smith), Anger (Lewis Black), Fear (Bill Hader), and Disgust (Mindy Kaling) shape every aspect of her being and we see how growing up and new experiences shape who she will become. We also see what what happens to the parts of childhood we leave behind in the person of Riley’s imaginary friend Bing Bong (Richard Kind).